Can't get off of here, no matter how hard I try. I am the same way. I also sleep with some small copies of pictures of Jimmy under my pillow. When you write your GSCE English Language exam paper on Jimmy Page - relating to the question 'Write about an Idol/Hero in your life' (or something to that effect). And getting a big fat A for it. Best bit of rambling I ever did. And to think, all that time you could have been studying grammar and spelling! I sing Zeppelin songs at school and everyone looks at me like I'm crazy. No one my age listens to Led Zeppelin. I'm sitting in class doing algabra and singing quietly, "communication breakdown, its always the same, havin a nervous breakdown, drive me insaaaane!!!" I look up, people are looking at me, wide-eyed, and they say, What are you singing. I reply, Communication Breakdown! How could you not know that???!!! I have 100,000,000,000,000,000,000,000,000,000,000,000,000,000,001 pictures of Jimmy♥ on my iPod and I can't fall asleep without looking at each one. I sneak it into class and look at one when I get stumped on question. Thats why I sit at the back of the classroom! Bron-Y-Aur Stomp is my favorite song! If you have a birthday party for Jimmy. I got a worksheet in science about "Why are levees built?" And wrote "So Led Zeppelin could sing about them"
Cool! You born in 94 too? - You own 10 Zeppelin shirts. - Your bedroom wall is covered with posters/pictures torn out of magazines of the band. - You go through phases when you listen to nothing but Zep. 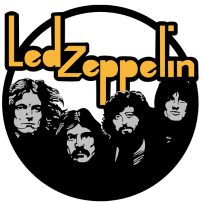 - You try getting as many of your friends as possible into Zeppelin. - You own every known pro shot show to exist and most audience recorded clips on dvd. Ahhh, I could go on but you get a fair idea. Awesome! Always nice to meet Zep heads my age! I know I'm obsessed because everytime I get a drink with a lemon on it, I have to grin. That's great. I think about Zeppelin every time i hear the word. I also am writing a story that involves Jimmy (and Robert). Sneakily blow kisses to Jimmy on the cover of Mojo Classic (with the Zep cover) at work everytime I walk by. Wonder names of equipment and guitars people use, like a wah wah pedal, like Jimmy uses.